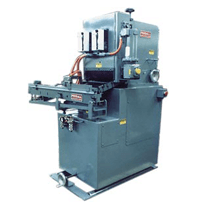 Model 1700 Automatic Bar Feeders — The Feedall line of automatic bar feeders offer the capabilities to automatically feed bar or tube stock to centerless grinders, thread rollers, induction heating equipment, polishing machines and other special processing operations. Each bar feeder begins with a standard design which we customize to your specific needs. Feedall automatic bar feeders are the most versatile and widely capable quality feeders. Feeds bearing cups from a manually loaded, floor mounted magazine with two lanes. Then the cups are loaded into a magazine at the top by customer and discharged in a continuous stream.